Last August one of my legs stopped working. I was trying to roll out of bed and my left leg did not respond to the usual nervous instructions and so I collapsed in a heap on the floor. In hospital it started working again, they said they would do an MRI scan to check there were no problems. I got the MRI in December. This found that the nerves coming out of my back that control the groin downwards were impinged and so were not sending commands properly all the time. This also explained the quopping in my lower back, groin and legs. I was referred to a surgeon and eventually got operated on last Wednesday, 7th June. How is that for a speedy service? Well done the National Health Service. My legs feel much improved by the operation – no, if I may use an epanorthosis here – my back and legs are bloody marvellous and I feel unbelievably happy about this. I am back! I have made a remarkably speedy recovery from the operation, so The Editor and I decided to celebrate with one of the few old glories my chum Jeremy managed to gather up from what remained of our cellar in Burgundy (he gave us a few devilishly cunning wines as well, for anyone who might visit and think they are good at blind tasting). Our first bottle, a 2005 Northern Rhone was totally oxidised. Our second stab, a 2010 Barolo was terribly corked. Consequently, we decided to go with a bottle made by Jeremy’s own fair hand. Considering the quality level and vintage, it was mind-bananafyingly good. If you saw this wine on a restaurant wine list where you knew they sourced their wines carefully, getting a bottle should be your priority – beyond even getting food! The moment I stuck my nose into this, and The Editor can confirm this, my legs prickled with goose bumps. It was terribly good: I knew it, it knew it, we all knew it. 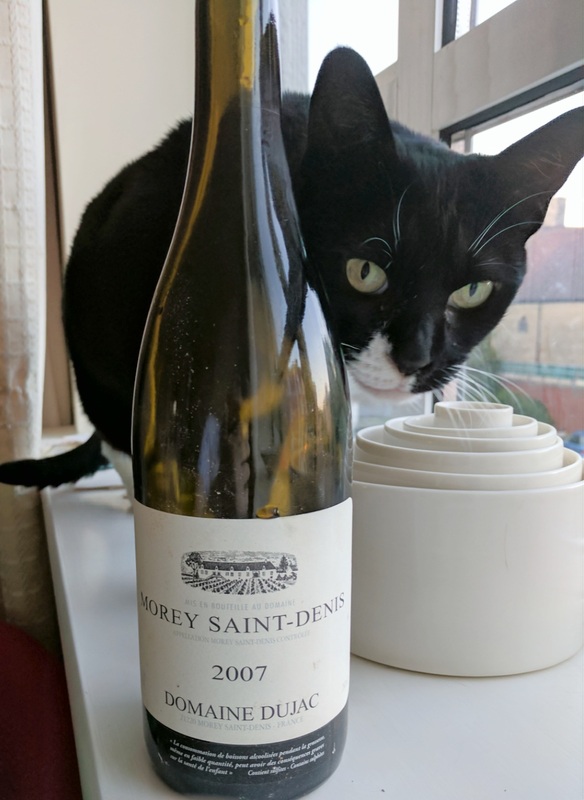 Now, do not take this as meaning every bottle of 2007 villages Burgundy (nor, god forbid, Bourgogne Rouge) you have dreadfully-advisedly kept in storage until now, will immediately elicit this reaction when you finally realise you should be drinking yours. No, Dujac are at the top of the very top echelon of red Burgundy producers, and this has been kept in their cellar until a few weeks ago. So it is the cream of the crop that has been perfectly stored in brilliant ageing conditions until it hit our Riedels. These factors do not apply to the vast majority of 2007 red Burgundy remaining in the world. Moving on, the nose is a fantastic melange of soft plummy fruit, fresh, delicate blooms and remarkably lively, sweet blueberry and blackberry aromas. It is almost unbelievably fresh whilst still being in a gloriously mature state of development. All the characteristics on the nose are woven together in an involute tapestry that The Editor thinks is supported in a noticeable oak frame, but he is wrong, it is spread out on the limestone soil above Clos St Denis ready for you to enjoy your picnic on. And your picnic is as remarkable as the tapestry of the nose. It certainly is a very svelte collection of fruits that richly envelope your palate with their perfectly mature class. It has the Morey combination of dark fruit and floral characteristics. This fruit is really delicious! It has a great structure too – not tough or dry, but lively and supportive for the fruit. The tannins are silken but there are more than enough of them to give the palate balance. The same is true of the prickle of acidity that runs through the palate – pure class! Considering 2007 is negatively referred to as a ‘restaurant vintage’, this has a really classy character, with great harmony on the nose and palate, and it is charged with impressive complexity. What a totally marvellous bottle of villages red Burgundy that has everything is needs everywhere it needs it! Chapeau, Jeremy!